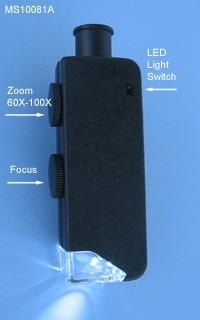 This is our smallest illuminated zoom microscope. Lenses are made of glass and provide clear images. It is an ideal pocket microscope for Electronic Engineers, Hobbyists, Printing, Plate making, Scientists and Students. Box measures 88mm x 40mm x 28mm. Each microscope comes with a synthetic leather pouch and individually boxed.